Update – After several leaks and official teasers, the launch date of the upcoming Vivo X6 smartphone had been confirmed as 30th November. The company took to Weibo to confirm the schedule of the launch event. While we already got the first look of the device through TENAA listing, the company also confirmed few features of the device like Fingerprint sensor and Twin-Engine flash charging technology. The 2013 launched Xplay 3S had been the first smartphone to feature a 2K display, and one of the few smartphones to features such a high-end specifications. Now by launching Vivo X6, the company might set new standards n the smartphone industry if the rumored features come true. The device might measure just 4mm thick and comes with 3D Touch display, but we feel the company has to leave either of the features to include the another. The leaked certification suggests the device to come in two variants while the Vivo X6D comes with mid-range specifications, the Vivo X6 might sport true flagship specifications. There are few rumors that the device comes with dedicated graphic RAM. While nothing is confirmed till now, take this with a pinch of salt until we have the official source. Earlier: Nov 18, 2015 – Vivo has been successful in creating buzz around its upcoming smartphone Vivo X6. Along with the confirmed specifications and rumored features, it will be first of its kind smartphone in the market. While the company had officially confirmed the 4GB RAM and fingerprint sensor, the leaked images suggested the device to come with iPhone 6S like 3D Touch and side-by-side multitasking as seen on Samsung devices. Now the latest feature of the device is in its charging department, by using the twin-engine flash charging technology the device can be fully charged in much lesser time than the other fast charging technologies. It uses the dual-charging chip and dual charging circuit that makes the device more secure. According to the company this new technique can help the device to charge in half of time taken by other devices. Recently Huawei had also shown their fast charging technology that charges the 3,000mAh battery to 48% in just 5 minutes. While that is still in the testing stage, it will not be available to users anytime soon. Qualcomm came up with Quick Charging 3.0 that is 38% more efficient han the Quick Charging 2.0; it can charge the typical device from 0% to 80% in just 35 minutes. While the device will be launched in the first week of December, we can expect more leaks to follow, stay tuned! 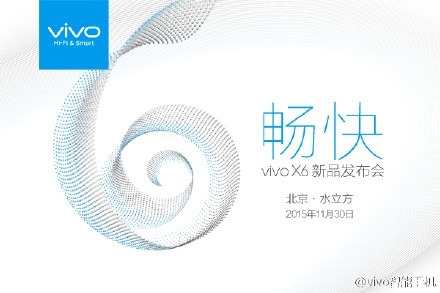 Earlier: Nov 14, 2015 – We had exclusively reported about the Vivo X6 smartphone to launch in the next few weeks. The company had been teasing the launch of the device by posting few specifications on the companys official Weibo account. A couple of days back the device was spotted in an image posted on Weibo, and now we have the images from TENAA suggesting the design of the device. The device comes with all metal body and will be available in the colors Silver, Gold, and Rose Gold. The confirmed specifications of the device are 4GB of RAM and a fingerprint sensor on the rear of the device. A leaked image also confirmed the device to sports iPhone 6S like 3D Touch for this device. From the images, we can confirm the device to sport the fingerprint sensor along with the rear camera and an LED flash on the back. On the right, we can find the power button and the volume rockers while on the left it includes a hybrid SIM slot. The device is rumored to sport 6-inch Quad HD display with 2.5D Gorilla Glass on top of it. As per the listing, the device will be launched in two variants with the model numbers X6L and X6D. The device will come with all metal body which will cover 98% of the device. It is expected to be powered by Helio X20 deca-core processor rather than the recently unveiled Snapdragon 820 SoC. Stay tuned for the official images and the specifications since the device is expected to launch by the end of this month.